How one Sunset District house got turned around in 1930. We’re used to earthquakes. The anniversary of San Francisco’s great earthquake and fire in 1906 is a yearly reminder to change the batteries in the flashlights and switch out the water in the emergency box. (The San Francisco Department of Emergency Management has a nice checklist of what your preparedness kit should include.) I think we’re beginning to take the possibility of a tsunami seriously, despite the crowds of yahoos who run to the beach with their cameras when the alarms go off. An increasing multiplicity of emergency scenarios in which to imagine ourselves has arisen: gas explosions, floods, and nuclear meltdowns. Now we can add tornadoes to the list. On March 18, 2011, the Emergency Alert System warned of possible tornadoes in the Bay Area. One hit in Santa Rosa, ripping a shed to pieces with 100 mph winds. Then a waterspout touched down off Ocean Beach with a menacing, if mesmerizing, dance on the waves. The Outer Sunset has been hit before. 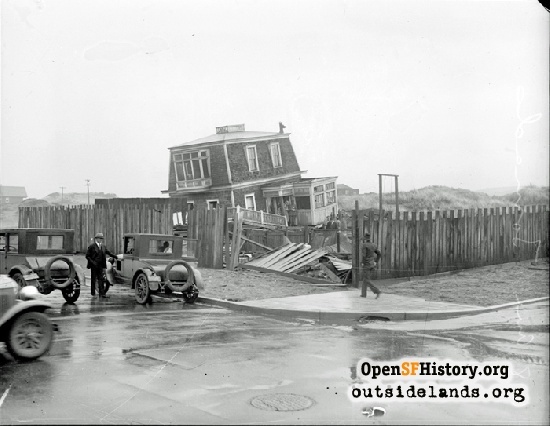 On February 24, 1930, a mighty storm battered the Bay Area. Strong waves and wind swept a deckhand off a tugboat at the Ferry Building; lighting struck Oakland’s city hall, starting a fire; snow and hail fell in the Mission District. Then the police received reports of an explosion near the corner of 46th Avenue and Ortega Street. The owner, John Voltz, had been at work at the time. He wasn’t immediately available to comment as emergency crews, reporters and curious neighbors crawled over his property, posing for photos on the steeply raked floors. The only other major damage in the area was the destruction of a garage in the backyard of 1800 48th Avenue. San Francisco’s four daily newspapers gave the tornado light coverage, and didn’t exactly know what to call the phenomenon that moved a house. “Freak squall,” “freak storm,” “a miniature twister” were three attempts. Voltz estimated his losses at $5,000, but he didn’t seem to have given up on his Oceanside house completely. Go take a look at the tall house that stands at 1896 46th Avenue today. 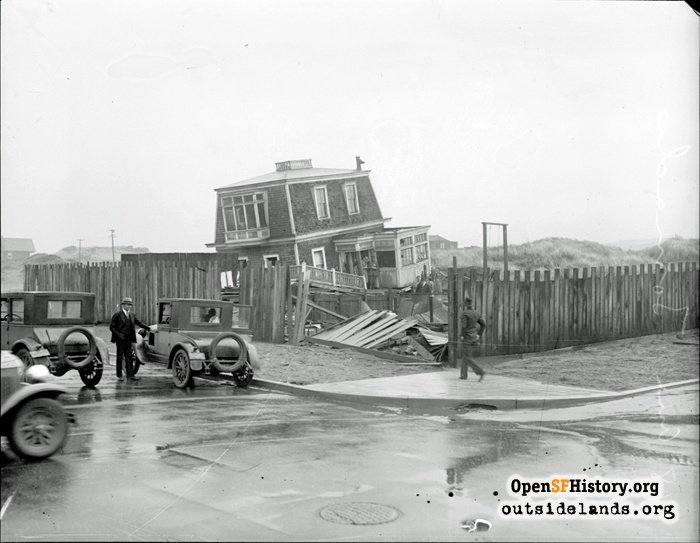 Compare its angled upper floor to the tornado-stricken structure alee in the dunes. Instead of retreating, Voltz rebuilt with bravado, taking his home even closer to the clouds. Page launched 22 September 2015.